The circuit consists of ordinary components (except of ATtiny13 in some cases). The IC1 is an infrared receiver at 30 kHz. The T2 makes the switch On/Off of Media Center when it gets a High level by IC2. The K2 is connected at the “power switch” connector of your PC’s mainboard (motherboard). The two diodes are put to make the connection of K2 to the mainboard, easy. You don’t have to worry about which polarity you have to connect this connector to the mainboard. Connect it as you wish. K1 is connected to the power switch (button) of your PC’s case. So, you can turn On/Off your media Center with both remote control and your case’s power on/off switch. K3 is connected at your RS-232 port of your Media Center. It can work on both real RS-232 ports and USB-to-RS232 converters, in case you haven’t got a real RS-232 port. The +5V can be taken by 20pin ATX connector and specific by the pin “+5VSB” (purple cable). The power supply of the circuit must be done by this cable (+5VSB) because it’s the only cable that has +5V voltage when the computer is in hibernate, stand-by or power-off mode. The circuit has to be power supplied always for being functional. The ground pin (GND) of the circuit has to be connected with one of the black cables. 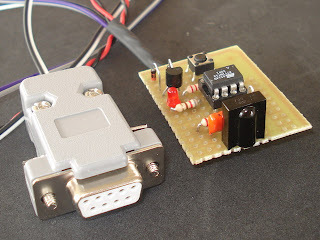 At the circuit’s photo you cannot see the R4, D3 and C2, because they are included in RS-232 connector’s case to reduse the number of the used cables. You can use the Girder 3.2.9 as it is easy-to-use and the last freeware version of this powerful software. A second choice is the “PC remote control v4.213” that it can work with my circuit too. Download the assembly source code, hex and schematic of the circuit.